I’m loath to feed my two-year old anything that comes out of a box. It’s only a slight exaggeration to say I think Cheerios are evil. We could talk more about that, but that’s another post for another day. Instead I’ll step away from my soapbox (you’re welcome!) 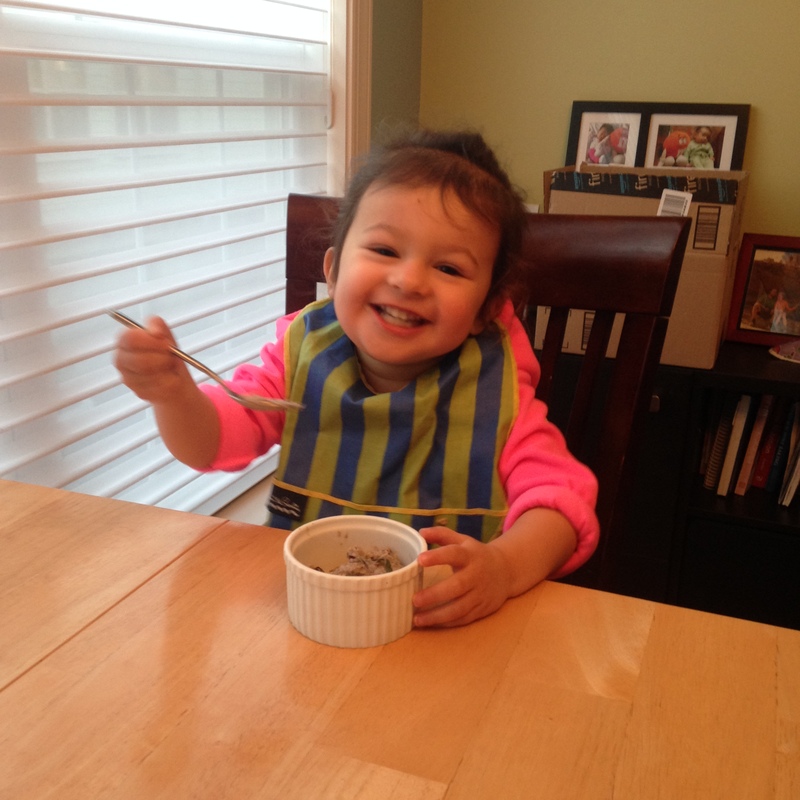 and share with you my make-ahead oatmeal recipe that works around the Cheerios problem. It has a great mix of all the macronutrients and a hefty dose of vitamins and minerals. Blueberries – an excellent source of antioxidants – are one star ingredient. Two other heavy hitters are spinach and kale, which are loaded with vitamins and minerals. The ground flax seeds and chia provide omega-3 fatty acids, which are important for your little one’s cognitive development. I only half-joke when I say I’d be ok if this was the only thing Siyona ever ate! In fact, these oats often round out lunch or dinner at our house. I’m guessing I lost a few of you when I listed spinach and kale among the ingredients. I know it sounds strange! But I promise you the flavor of the dark, leafy greens is pretty subtle. And if you’re worried, you can always use less than I do. 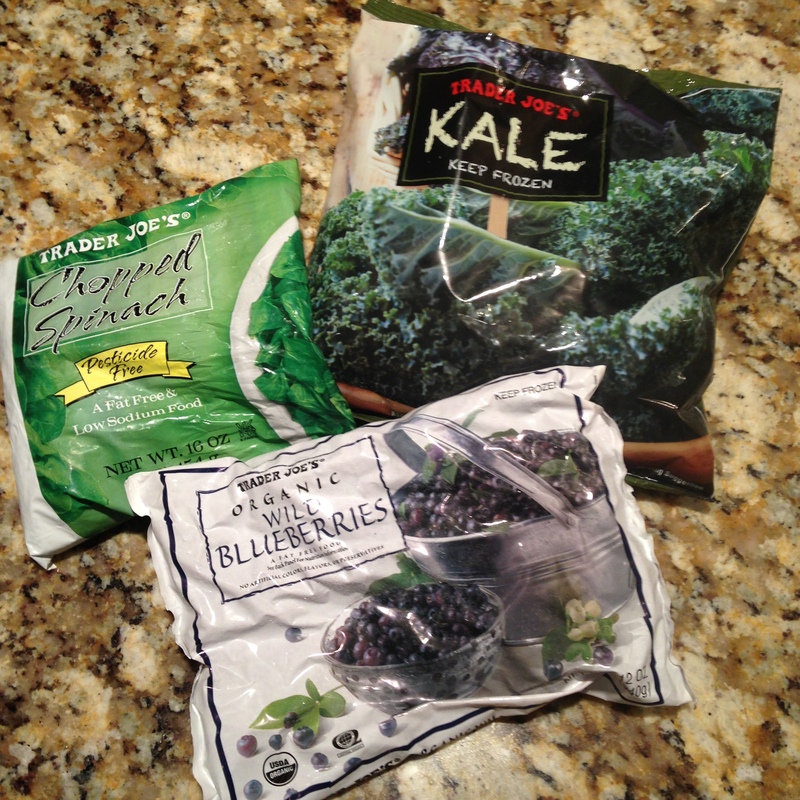 Here’s another tip: I always have a bag of frozen spinach and a bag of frozen kale on hand in my freezer. I toss them into SO many recipes to easily up the veggie content – soups, smoothies, stir frys, chili, even my chicken enchiladas! I do so love the Trader Joe’s!! The wild blueberries are nice for this because they’re small. It’s a little bit time consuming relative to making instant oatmeal, but you can make a big vat that you keep in the refrigerator for several days. (And, anyway, instant oatmeal is gross!) Not only is warming optional, I actually prefer it cold. The recipe is also very flexible. I make my oats with water, but you could easily use milk. 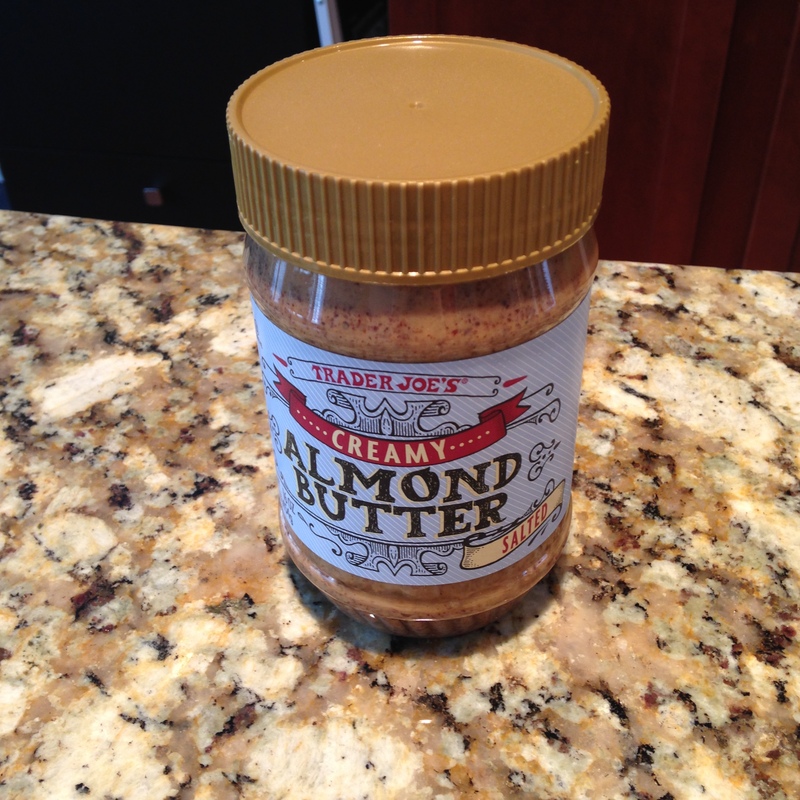 I use almond butter, but if your child (or you! you can eat it too!) has a nut allergy, sunbutter would make a fantastic substitute. And consider my quantities suggestions. Do everything to taste. And if you like this post, do me a solid and repost! Cook oats in water on stove top until desired doneness. Kill the heat. Add almond butter and stir until incorporated (do this BEFORE adding the frozen ingredients as it will blend better). 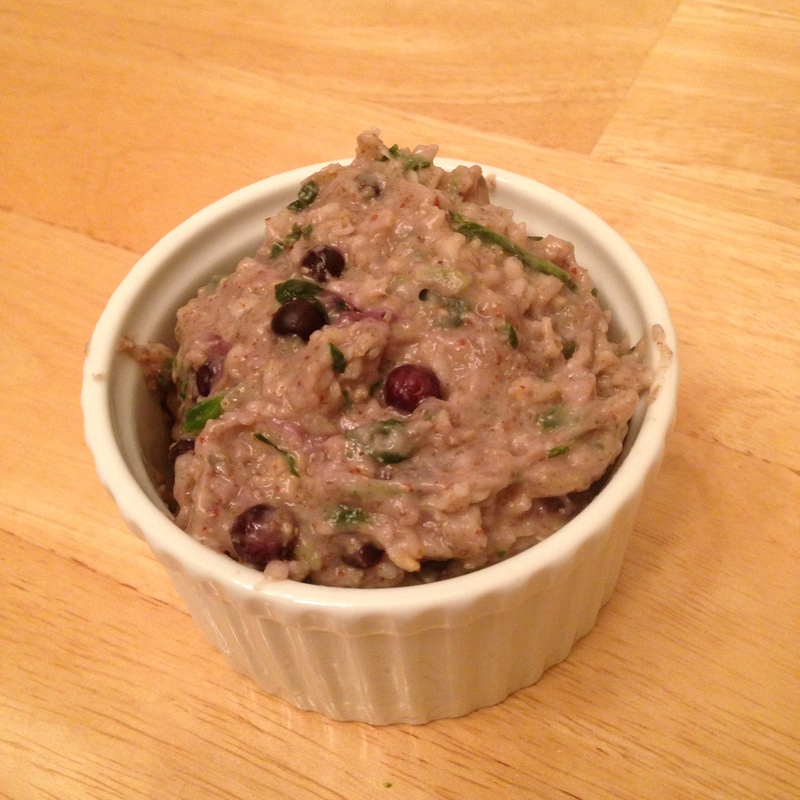 Blend in the mashed banana, chia, flax, and cinnamon. Stir in the spinach, kale, and blueberries. Cool to room temperature before refrigerating. Next postThanksgiving Guilt Be Gone Circuit!